I just attended Low Carb USA at San Diego where I shared much of the data below. 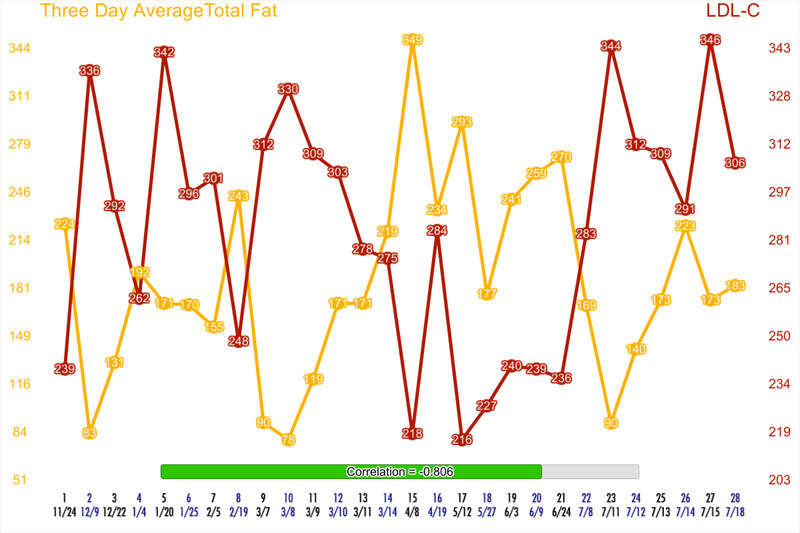 And while I was interested in a possible divergence that seemed to appear at the end of May in Part III, it turned out to be more of a one-off, probably due to a higher percentage of protein and a lower percentage of fat than my usual ratio. In upcoming Part V, I’ll be revealing some new data on a “second N” to my study. I should have that up within the week. For now, note that the new 21 to 28 data points include a 9 day period where I once again did a total of 7 days of blood draws. Thus, we again can see this mechanism in nearly real time. I now have very high confidence that this regulatory pattern is likely present with virtually everyone who is fat adapted (getting the majority of their energy via fat) without an underlying metabolic condition. It’s also quite possible this applies to those who are not fat adapted yet still with no underlying metabolic condition. For that, we’d need more study. Thanks for sharing. I have insanely high LDL-P numbers for which I never had a point of reference. I love seeing yours and comparing them to my numbers. I guess I need to step up my fat intake. I don’t know at this point if I consider a higher LDL-P a good or bad thing if you don’t have any underlying metabolic derangement. I’ll cover this in greater detail in an upcoming post all its own. But in short, if you feel great on your current diet and your other numbers are good (such as hsCRP), then I’m skeptical you need to intentionally eat different just to change that number. On the times I have eaten a lot more in order to test that outlier, I didn’t feel as good as I do when I’m closer to that midline you can see in my graphs between the extremes. A pleasure to meet you in San Diego. Looking forward to more great data from you. Thank you, Bill. There’s quite a bit more to come! but you probably know most of his info. Oh yes — he’s actually one of my favs. In fact that video you posted I’ve watched at least twice when I was first starting my research. I am a 53 year old dude that has been eating low carb since February 2014. I had been morbidly obese man for much of my life (in the 300 to 400 pound range for 25+ years). I lost 250 pounds eating LCHF, reversed diabetes and hypertension – regaining my life and my health. Since going low carb I found that I am a hyper-responder. While an obese carb eater my LDL-C was typically at or around 120. The doctor’s over the years talked statins but never prescribed them. At 5 weeks into this WOE I had my first cholesterol test. My LDL-C was 140 & TC was 205. The doctor suggested statins but I declined. In my next lipid panel a year later (March of 2015) my cholesterol had skyrocketed. LDL-C was 248 and TC had risen to 304. The doctor so didn’t believe it that she had me retested. I had similar results. She had the prescription pad out. I told her no – let me work on it. That is what I’ve been doing ever since. I’ve logged my food fairly well, made dietary tweaks along the way, and I’ve had my cholesterol measured regularly along the way. In other words, I have quite a lot of fairly good data. Two days ago I got the results back from my latest cholesterol test. My LDL-C was 62. TC was 161. HDL-C was 89 and triglycerides were 49. I think my doctor will be pleased and finally put away that prescription pad. I still eat low carb and I don’t cheat. My current macros are around 15% carbs (50% or more of that being fiber), 25% protein, and 60% fat. My cholesterol was at its worst when I was actively losing weight, eating little fiber and had macros of 7% C, 25% P, and 68% fat. Initially I had no idea what to do about my crazy high cholesterol. I searched the web for answers and finally landed on Franziska Spritzler’s lowcarbdietitian.com website. She had experienced the same thing eating very low carb and had some very helpful suggestions in two lipid blog posts. I later found similar suggestions on dietdoctor.com. Needless to say I am happy with these latest results. I see my doctor in a week (or so) and I expect that she will be pleased as well. She has never had a patient lose over 200 pounds (and keep it off). I don't think she has ever had a patient resolve a cholesterol issue like this before either. Was my high LDL-C & LDL-P a danger to my health? As you have pointed out, there is no way to know. No studies exist for those of us eating low carb daily. But the fact is that it could have been unhealthy. I'm glad to have it resolved and even more glad that I was able to do it and remain low carb. Low carb is how I need to eat to stay lean and healthy. I'd be happy to share more information with you if you are interested. If you sign up on lowcarber.org forum (free) – you can post a comment in my journal or in my milestone posts. FYI: There is a boatload if information about how to do this WOE and how NOT to do this WOE in the forum posts at lowcarber.org. IMO – it is a data treasure trove hidden in the histories of thousands of dieters logging their journeys. It is basically an Atkins Diet site that has been around since 2002. It has had thousands of members over the years. I learned a lot from pouring over various posts and journals. I found good advice and lots of bad advice (as you would expect). Most members fail. But I found the journals of some very large people who had managed to find success. The took the weight off and have kept it off. I copied what they did and found success, too. Go figure? Diets fail – even low carb. Making this a WOE – a permanent lifestyle change – works. – I’ve never seen an LDL-C or LDL-P that low with someone on LCHF. I’d love to see what your average morning glucose and ketones (BHB) numbers are. Do you take them regularly? – I mention this as an aside… there are some (and I emphasize *some*) who experience a dramatic drop in their cholesterol after a long term drop in weight and a plateau period (from LCHF), and then seemingly out of nowhere, their cholesterol jumps up and remains high. I have some theories on this that I won’t go into here, but I wanted to give you the heads up on this possibility. While I’m a bit buried right now, I’d actually like to get into a deeper dive of your story and will read through it on DD and lowcarber. I may do further commenting here afterward. And of course, congratulations!!! What an amazing accomplishment to be proud of! I had my annual checkup yesterday and received the results of my standard cholesterol test. Looks like those NMR results were not a fluke. My standard lipid panel taken a week later mirrored the NMR numbers pretty closely. I would assume that the very low LDL-P score on that NMR is accurate, too. 2017 A1c: 5.4. It was 5.3 last year and 5.1 the year before that (2015). In March 2014 I was diagnosed a T2 diabetic 5 weeks into my LCHF diet. That A1c was 6.7. So it looks like those NMR results were in fact done with my blood. I shared the results with “the lowcarbdietitian” and she said she had never seen an LDL-P that low either and that it many not actually be a good thing. But, I am one of those who was working on this to try and “get the doctor off of my back.” Mission accomplished. My doctor was pleased as punch and for the first time in 3 years she was not pushing the statins.. I will remember your protocol next year and eat appropriately prior to my next checkup. To answer some of your questions… I do have lots of BG data tracked in an app on my phone. 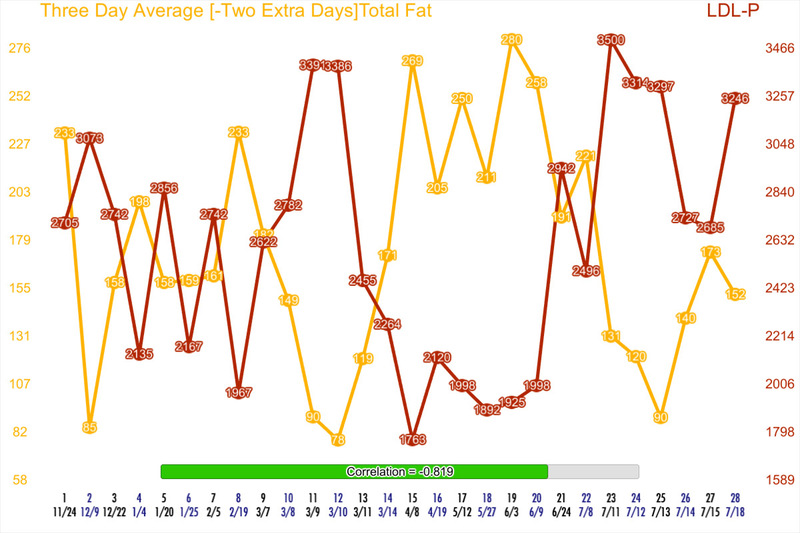 I didn’t start tracking BG for the first 10 months of this WOE. It was when I got a meter that I learned that I was reactive hypoglycemic. I was still quite insulin resistant and even a 10 or 15 net carb dinner would push my BG from a predinner 100 to over 150 in postprandial readings (30 minutes apart). Some meals (like overcooked/pureed LC soup) even spiked my BG over 200 and then it crashed within 30 minutes to well below the premeal reading. When that low BG thing happened I would get the ‘raid the pantry’ feeling. Carb cravings from a 10 carb cup of soup gave me carb cravings? That was an ah-ha moment for me. Classic reactive hypoglycemia. I found the primary driver that was causing me to constantly overeat. When I learned to eat and maintain a normal arc to my postprandial BG I discovered satiety between meals (kind of a new concept for me). 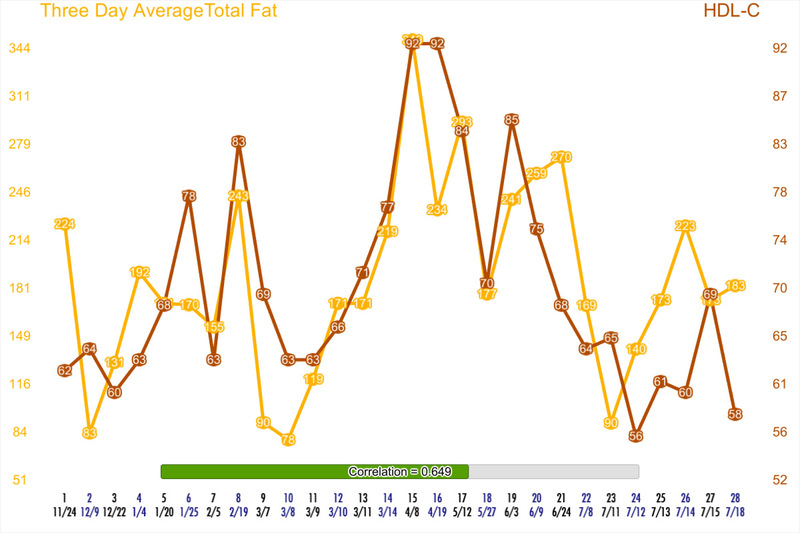 My insulin sensitivity started to kick in at about 1 year into the LCHF diet. Two things happened at that time. I’d broken my foot walking and that put a halt on my physical activity for a while. I wanted to continue to lose weight and a decent clip, so I went very ketogenic with my eating (< 20 net carbs) and started doing intermittent fasting once or twice a week. I also stopped snacking after dinner and built in a 12 hour fast daily. 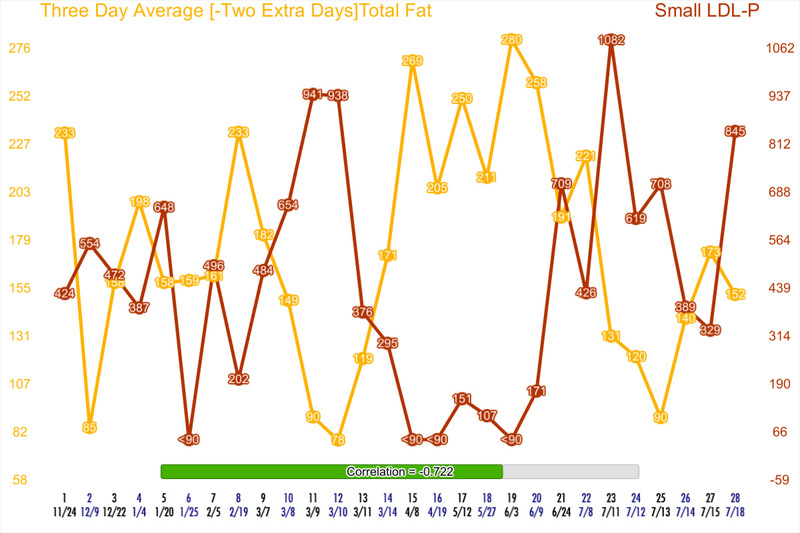 I was tracking my FBG regularly at that point and watched it plummet within just a few weeks after applying these new diet tweaks. My FBG dropped from an average of 105 (or so) to regularly falling in the 75 to 85 range. My predinner BG dropped by the same amount. But the most interesting thing is that my postprandial BG would hardly change at all after eating a low carb dinner (8 to 15 net carbs). Pre-dinner BG would be around 85 and I rarely cracked 100 in my post meal readings. A few months later I added back more net carbs (to about the level I am eating now) and my postmeal BG rarely exceeds 100. My first NMR (taken a year later) give me an IR score of 25 – the lowest IR category. So it was somewhere around January 2015 that my insulin resistance problem was resolved. But wouldn't you know it, a month or two later I had cholesterol labs done and that is when my LDL-C jumped from 129 (June 2014) to 243 (March 2016). I saw a Dr. Sarah Hallberg video on Dietdoctor.com where she suspected that this hyper cholesterol reaction that some of us have seems to occur well into the diet at about the same time as insulin sensitivity returns. That seems to be the case for me. She went on to say that she didn't know if it was a temporary thing or if it would improve over time. Well – mine has improved (or at least gone down drastically) since those crazy high results 2 years ago. Will they stay that way? who knows. One more think on the resolved IR thing… I accidently drank a regular soda (thinking it was diet) a few months back. I was just about finished with it when I sensed something different. I could feel the sugar rush. I hadn't had sugary soda in nearly 3 years and almost panicked. Where's the ipecac? I calmed down and decided to make this a learning experience. I tested my post-soda BG every 15 minutes for the next 90 minutes. It stared in the low 90's (5 minutes after the soda) and peaked at 111 at the 45 minute mark. 55 carbs of sugar and I had not spike and crash. No carb cravings, either. So my IR seems to be a thing of the past and as long as I avoid things like soda and highly processed carbs it should stay that way. I did not measure ketones. I never have. I can tell if I'm eating right by what the scale does. If I eat carbs at a rate over my mysterious carb limit (somewhere in the 45 to 55 net carb range) then I put on 5 to 10 pounds in water within days. If I eat below that limit the water comes off again, just like the first few days after going on a low carb diet. I tend to eat carbs right at this limit so the scale bounces up and down in the 200 lb to 210 lb range. So I assume that I'm eating at the top end of the ketogenic range for carbs. It was when I went VLCHF that my cholesterol doubled. I added more carbs and a boatload of fiber to my diet and then my "bad cholesterol" slowly got better. Then, over the past year, it just plummeted to the results shown above. I was obese as a child in the 1960's. That was before the food pyramid and before low fat became the perceived "healthy" diet. I was the only chubby kid of my 3 brothers. When I was 5 or so my mom took me in for a glucose tolerance test. I don't know the results. I wish I did. But I do remember an argument between my mom and my pediatrician regarding the results. My doctor thought that the results were normal for a child. My mom had shown her PCP the results for a second opinion and he saw red flags in the results. So I suspect that I had a higher than normal response to the glucose. I think I have always been reactive hypoglycemic. I am more sensitive to high GI carbs than the average person. It took me 50 years to figure it all out, but I did. I found how I need to eat. Supplements: K2, magnesium, D3. I started taking Niacin (the flush kind), B-complex, & vitamin C starting in February, but recently dropped the niacin. I don't know if there is anything here that explains the huge LDL-P drop or not. A friend of mine had a significant drop in cholesterol from a 30 day dairy free trial and I wanted to see if I would have the same results. My dairy free trial is over. I like dairy and I'm not lactose intolerant. I will add it back to my diet, perhaps a little more in moderation that I had before. I will be curious to know if my LDL cholesterol will shoot back up from adding back dairy.